Today’s modular machine designs require decentralized architecture. Conventional automation modules have begun to migrate from the conventional control cabinet directly into the installation. The new generation of KEB DIN rail IPCs is design precisely for this type of installation. The C6 SMART is perfectly tailored to the runtime environment and real-time capability with a powerful processor for performing complex automation tasks. The integrated micro UPS and spacious onboard memory make the C6 SMART a robust, reliable system. 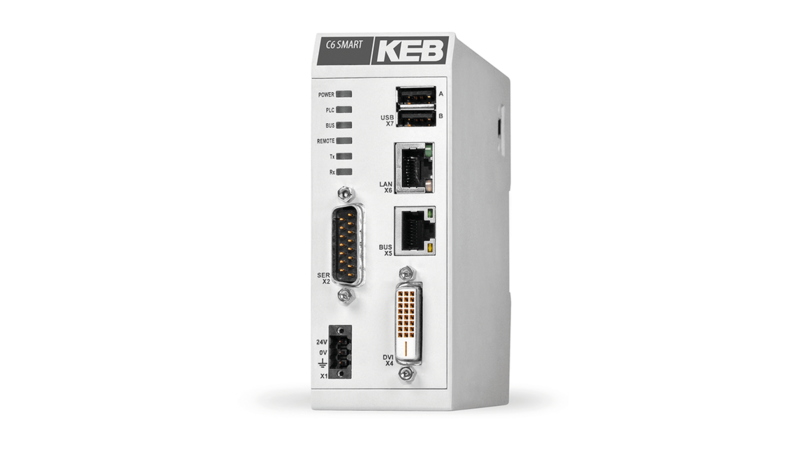 The device takes up 47mm on the DIN rail and supports direct coupling with remote I/O modules. A C6 Monitor can be incorporated to the decentralized installation using the SMART’s integrated visualization support - a DVI-D interface comes standard. Remote maintenance is another key feature of the SMART IPC. It comes equipped with COMBIVIS Connect software for secure troubleshooting and monitoring.